We are now back on NSW time again. It was very warm last night and about 15ºC when I get up at 7:35 am. We have a very relaxed start to the day, with Peter T making some pancake mix and Peter F and I cooking some up for Peter T and the kids, as well as a couple for ourselves. Days 26 to 28 of our trip, Fort Grey is far left of track. 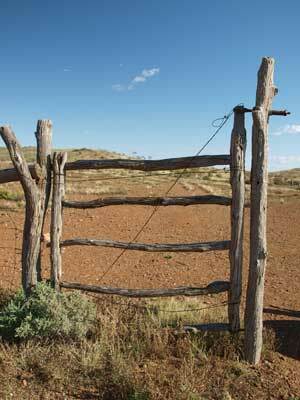 Tibooburra is where the three tracks meet in middle. 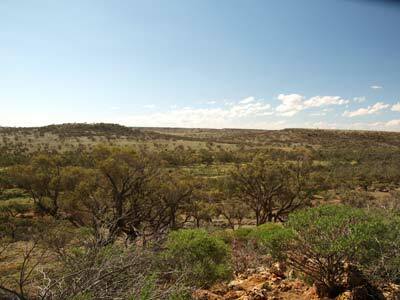 Milparinka is bottom, Mount Wood to the right of Tibooburra, Olive Downs at the top. We exited stage right. We leave at 9:40 am and a bit further on pass Lake Frome and Frome Swamp. There is a fair bit of water in both. At 10:20 am we hear on the radio that Peter T's troopie has stopped. We have travelled 44 kilometres. Just after we turn around and head back, he gets it going again but as we approach it grinds to a halt once more. We have a look, all the lights are on on the dash. We open the bonnet but there is nothing unusual, the battery connections are okay. I get in and have a go starting it. The engine turns over but it does not start. I then tell Peter T I know why it will not start and offer to fix for one beer. He accepts and after a few attempts, I get it to start. Peter wants to know how I fixed it. I say I will let him know. As we drive along (I am now driving his troopie) finally tell him. The troopie has two fuel tanks, the larger main tank and the smaller sub. Like my Prado, there is a manual switch that changes from one tank to the other. In the troopie, this button is under the heater controls. Sitting right in front of this is four year old Keith in his car seat. When they are driving along, Keith tends to sometimes put his feet on the dash. He obviously has pushed the button and changed from the main tank which is more than half full to the almost empty sub tank. Hence, no fuel, no go. 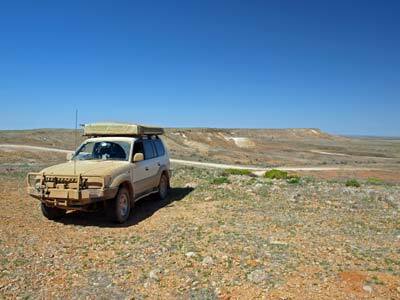 I drive the troopie for the drive into Tibooburra. 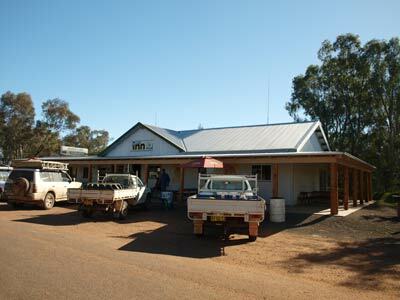 We arrive there at 11:30 am (122 kilometres) and go to the main petrol station which is on the southern end of the town. This is the fifth time I have been to Tibooburra. As I mentioned earlier, I worked out here for a few weeks back in the summer of 1980. Hell it was hot! Anyway, Peter F has to refuel as he is so low will have not enough to do the rest of the day's explorations. We are here for a while as people get some food and bits. We head off south out of town towards Milparinka. 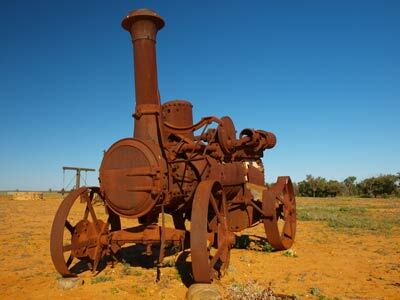 Our plan is to visit the historic areas near there and then come back to Tibooburra. 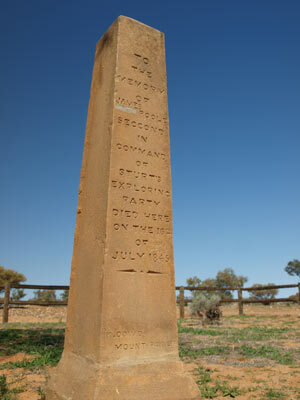 Back in 1844-45, Sturt led an expedition to find out if the fabled inland sea existed. He was stranded at nearby Depot Glen for many months as it was too hot to travel and they could find no reliable sources of water apart from what was here. Depot Glen is a permanent (or at least almost permanent) pool of water along a creek. Anyway, the second in command, James Poole, died when they were here. More about this soon. To keep his men occupied while stranded here, he had Poole get the men to build a stone cairn at the top of what was to be called Mount Poole. Poole's Grave Poole's Tree - the inscription was done in 1845! At 12:45 pm we arrive at Mount Poole and Sturts Cairn. 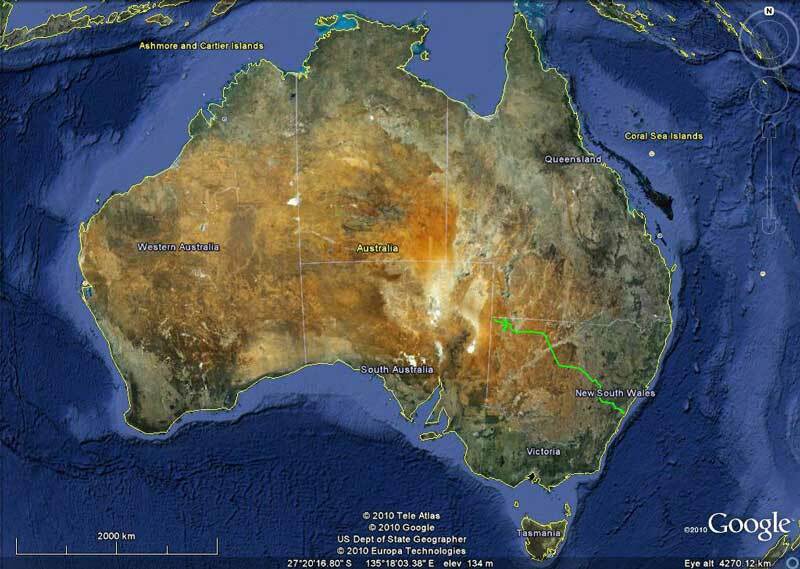 It is 51 kilometres to here from Tibooburra. It is now quite warm, 25ºC. We walk to the top from the car park, a short and relatively steep climb, but over a very rocky terrain (there is no real track). The views from the top are great, you can see 360º. It is obvious why Sturt climbed it in the first place, it would have enabled them to look a long way ahead for possible water sources. We walk back to the car and at 1:30 pm head for Depot Glen, which we by-passed when driving here. This is eight kilometres back towards Milparinka. There is only one sign now to Poole's Grave. We arrive there at 1:45 pm. We make lunch before exploring the area. Poole's Grave and headstone stands inside a small fenced area together with graves of a couple of people who lived on the sheep station. 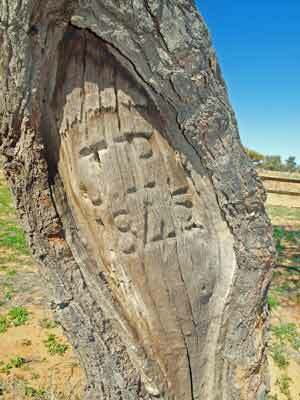 The old grevillea tree that was carved with an inscription when Poole died not only still stands, you can read the engraving. This reads "JP 1845". The main section of Depot Glen is in fact back about 800 metres or so towards Milparinka from memory. There is a lot of water here, with giant river red gums lining the pool, preventing evaporation and making it a quite a nice place to rest. We leave at 2:30 pm and drive back to Milparinka. We stop outside the Milparinka Hotel and go to walk in. There are a bunch of motor bikes outside and the riders are having a beer outside. One asks me "Looking forward to having a cold draught beer?" and I answer "I will have whatever they have got". They laugh. Only then do I understand, the pub is closed! What the hell! Why is it closed? There is no explanation at all, just a small sign in one of the windows. The bike riders finish their beers (which came from the fridge in the ute accompanying them) and head off. 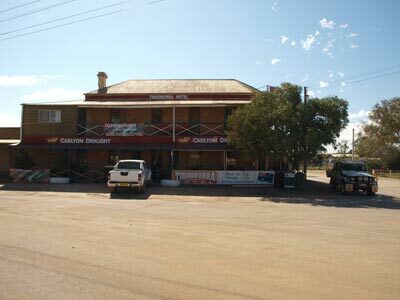 We take a couple of photos of the old buildings and leave for Tibooburra. A great disappointment. Again, no wonder NSW is so stuffed when people with a tourist attraction just close up without any explanation. Is it closed for good? Was there a death in the family? Who knows? 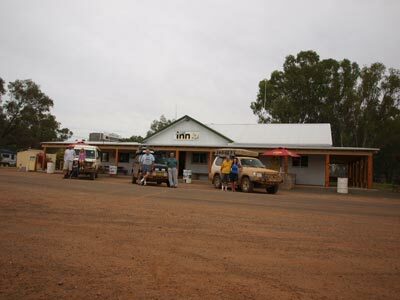 We arrive back at Tibooburra at about 3:45 pm and pull up outside the Family Hotel. We go in and order a beer. Not the friendliest service I have ever had in a hotel, in fact, one of the worst, perhaps the worst I have ever had in a small town. No smiles, no chat and even quite rude dumping of beers and chips and pies on the bar. When Peter T orders a sausage roll for Keith, she even dumps it on the bar still inside it's plastic bag. The tomato sauce bottle she provides is so empty we could only get a drop out of it. Worse still is the fact that this is the owner! 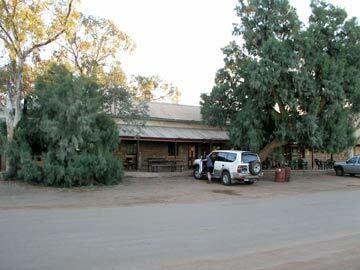 I have two beers, I should have only had one and walked out and gone across the road to the Tibooburra Hotel. The only reason I had come into the pub in the first place was to show the other the paintings and drawings on the hotel walls. If I return and the hotel is still owned by these people, I will not bother drinking there at all. 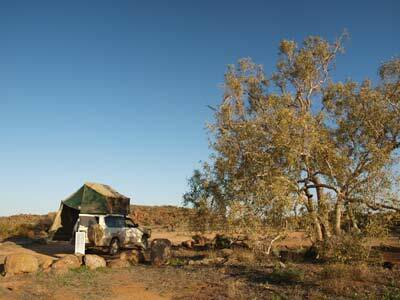 We leave town and drive the three kilometres to the Dead Horse Gully camping area. 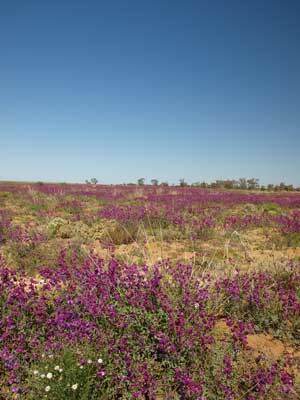 This is run by NPWS but it is not really in Sturt National Park, although the signs say it is. The fact is that this land has never been added to the park, even though it has been owned by NPWS since the 1970s. This is because the mines department (or whatever they are called now) objected to it as it may contain gold. 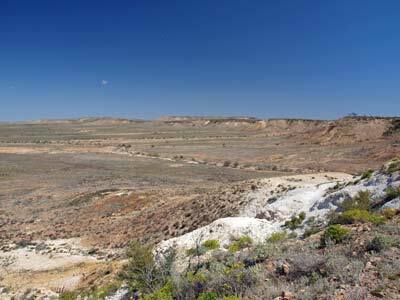 It is true that Tibooburra was established after a gold rush, but the chances of their being gold under the area now are very remote. 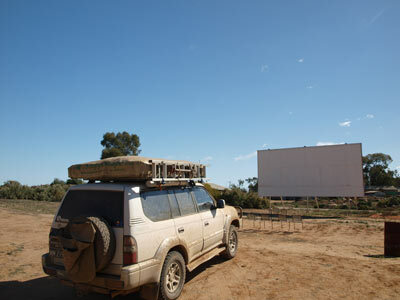 Believe it or not, one of only three operating drive-in theatres in NSW is located in Tibooburra. Back in 1980 I went there to watch a movie, probably the worst I have ever seen. It was Moment by Moment starring Lily Tomlin and John Travolta. It was so bad I walked out and went back to the pub and drank beer. Considering we were drinking cheaper take-away beers at the drive-in, it must have been terrible. We arrive at 4:30 pm and pick out a spot and set up camp. There are two covered barbecue areas (with gas barbecues and burners) as well as some tables and chairs and toilets. 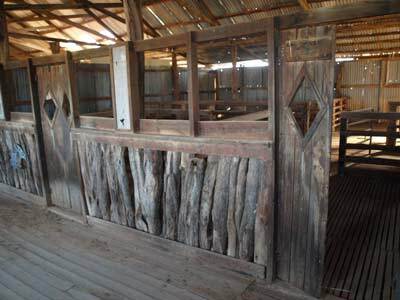 There is also another covered area. 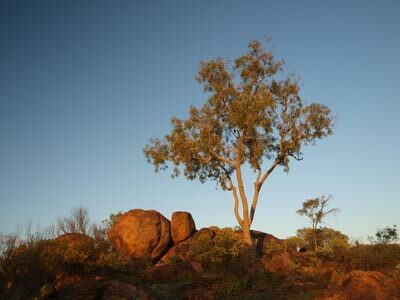 This is a very attractive camping area, with boulders to the west and south and views back to the town to the south-east. I set off with Keith to do the shorter section of walk here. Peter T and Melanie later join us. 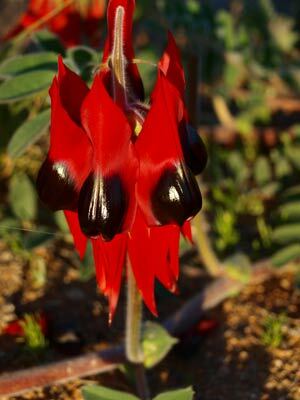 We see lots of Sturts Desert Pea, perhaps the most beautiful of the flowers or plants you will see in the outback. We also see a small kangaroo. We have pre-dinner drinks and nibblies and then try to start the barbecues. They do not work! As you cannot have fires here, we are in a bit of a bind. How do we cook our dinner of rissoles and sausages? We have a small gas stove, but it is not really set up for cooking something like this. We try and try and cannot get them to light. I have an idea! I go to where the gas bottles are stored. I squeeze my fingers into the container and push the bottles. One is heavy, one is light. I wonder, is only one bottle connected or turned on? I get some tools and remove part of the metal cover and then squeeze my hand inside the top. I turn on the bottle that is heavy. Within a few minutes we have the barbecues going. However, the gas burners will not work at all. Perhaps they are connected to the other empty bottle. This is a bit disappointing. Anyway, with a lot of effort we manage to cook our dinner and eat it in the cold. After dinner, Peter T provided fruit salad and ice cream. Luxury! Tonight there were a few satellites visible, we saw at least three as well as a few shooting stars. We went to bed at 9:30 pm as has become normal and read till 10 pm. It was a very mild night, the warmest of the trip. When I get up at 7:10 am it is already 15ºC and a sunny sky. 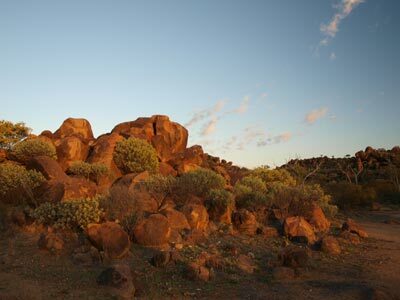 There is a very nice sunrise, with the sun shining on the boulders on the western side of the camping area making them go a real red colour. After breakfast we take our time packing up as we do not have a huge distance to travel today. We leave the camping area at 8:55 am but only go the few hundred metres to the Golden Gully mining display. 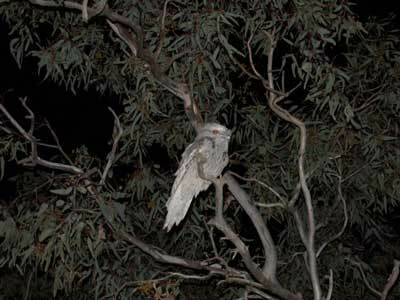 This was established by a former NPWS manager John Gerritsen (who I had only spoken to a few weeks earlier). 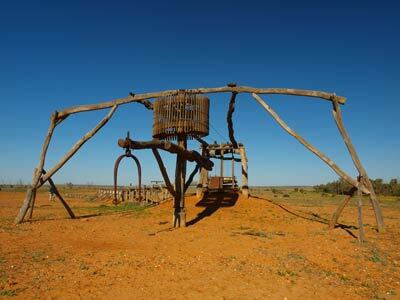 It is a replica of how parts of a gold rush mining area would have looked in the early days of Tibooburra. Well worth looking at. We leave at 9:25 and drive back into Tibooburra. I go to the NPWS Office to see if the Manager (who I of course know) is there but she is on leave in the Northern Territory. We go to the first petrol station/store but the fuel is much more expensive than the larger one at the southern end of town and the store has far less items in it than that one as well. We go to the other one and I refuel. We take 96.4 litres @ $1.476 a litre = $142.29. Kelly buys some food we need, including bread. We finally leave at 10:15 am after waiting for Peter T to be able to get water into his troopie's water tank. The plan today is to do the two loop roads out of Tibooburra and end up at Mount Wood. 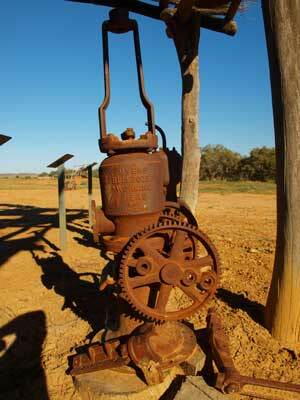 We head north out of Tibooburra on the Silver City Highway towards Noccundra in Queensland. Twenty minutes later and 20 kilometres we turn left onto the Jump Ups Loop Road. The road is a single lane dirt track, pretty good really. We stop at South Myer Tank. These tanks are constructed of earth walls and generally constrain water pumped from bores. 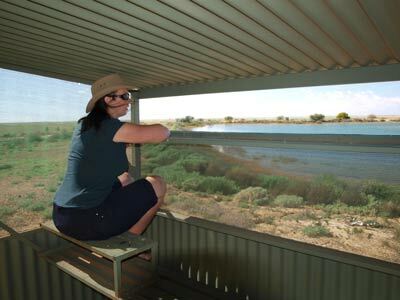 This tank has a bird hide on the north-western corner and we stop to have a look. There are a few ducks in the water, but nothing special. One thing that we notice is that the water is very clean. At 11 am we arrive at the Mount King tank. 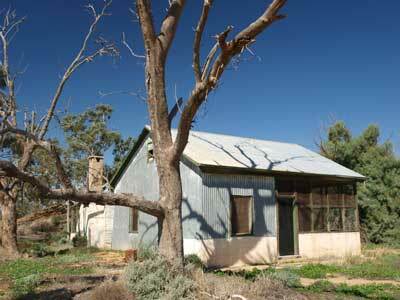 Mount King was another of the properties that was amalgamated to form Sturt National Park. There are a few birds here as well. Kelly decides to walk off with the cmera to photograph some beautiful fields of wildflowers. When she does not come back, I figure I better go look for her. As suspected, she has walked along the road and I pick her up. The Mt King bore is a few kilometres along but it has nothing of real interest. We see a few euros (a type of kangaroo), some red kangaroos, some emus, of which one almost looks like an albino. It is already a very warm 29ºC. At 11:50 am we arrive at Stubblefields Tank. This brings back a lot of memories. In January 1980 when I was out here working on a kangaroo research project, we used to get up at about 4:30 am and come here and catch kangaroos. Now when I mean catch, I really mean catch. The roos were trapped each night inside a fence around the tank (it had one way entrances) and we had to tackle the roos and bundle them into Hessian bags. The roos were then weighed, measured and had blood samples taken. A lot were then fitted with radio collars. The research was to find out why kangaroos die when subjected to any sort of stress. This was important at the time as do-gooders were saying that the kangaroo cull should be replaced by kangaroo farming. The only problem with this is that when you try to move a herd from one paddock to another, or put them in truck to take them to the abattoir, a large percentage just collapse and die. 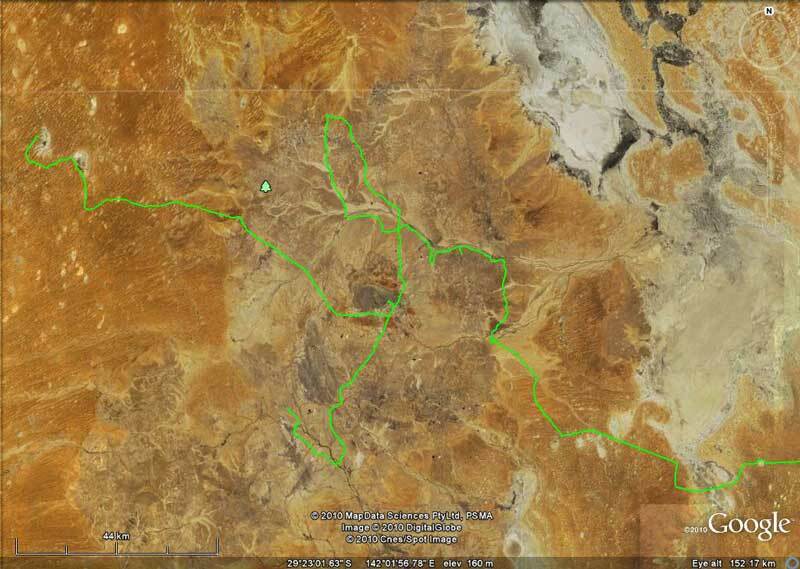 After the roos had been back in the wild, we would go up in our plane and track their location. The collar would indicate if they were alive or probably dead (if they did not move for a certain period the collar emitted a different radio sound). The dead ones were then collected by vehicle (again tracking them by the collar) and autopsied. This showed that the problem was myopathy of the leg muscles and in cases where the roo was dead, of the heart. 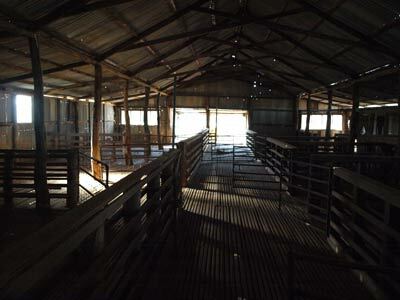 No solution has yet to be found to this problem, hence kangaroo farming is not possible. 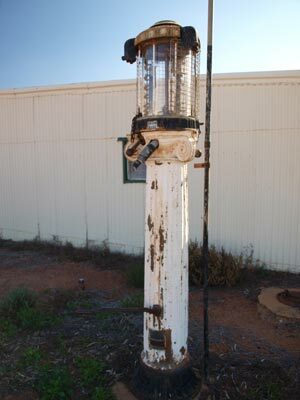 As mentioned, this tank is where we used to catch the kangaroos. We did this by tackling them (thus putting them under extreme pressure). I recall having to strip off and jump in the water to swim after one that was just going around in circles and grabbing it by the tail and dragging it back to shore. Anther giant roo, of about 75 kgs, hit me across the neck with his paw as I went to tackle him. Well, I thought I was bleeding to death as when I felt where he hit me there was a hot sticky liquid. I grabbed my neck, fearing my artery had been slashed by his sharp nails. I screamed for a colleague to shine his torch on my neck and hands so I could see how much blood was coming out. Well, it was not blood, but hot saliva from the kangaroo. I can tell you that he went down with my best rugby tackle. Anyway, enough of the reminiscing. 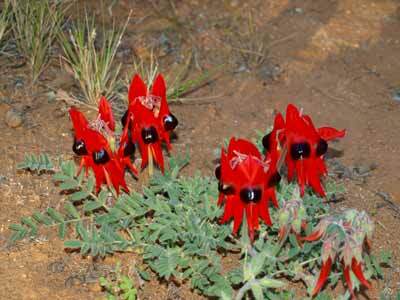 We have morning tea here and try some of the bush tomatoes (tiny, look like tomatoes but are a native plant). There are good views of the Jump Ups from here. We leave at 12:08 pm. We stop just before the climb up the Jump Ups (have a look at the photos to see why they are called this) to take some photographs and then stop at the lookout at the top. A really nice view back towards Tibooburra. 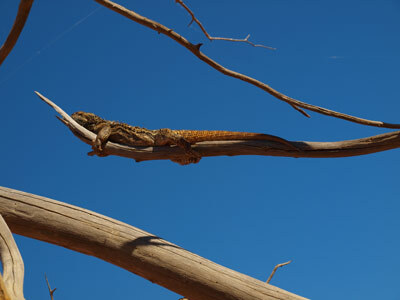 We are 58 kilometres by road from Tibooburra. A kilometre or so up the road is the Olive Downs Camping Area. This is a smaller site, but quite nice, with toilets, gas BBQs and tables. We continue onto Olive Downs and look at the once proud homestead and its tennis court as well as the ruins of the shearing quarters where I stayed in 1980. These were almost totally destroyed by willy willy (mini typhoon) sometime before my last visit in 2003. It is now even hotter, 31ºC, the hottest day so far in almost four weeks. 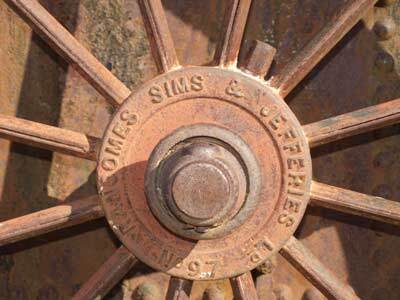 We travel back to the Silver City Highway and head back towards Tibooburra. At 1:13 pm, 28 kilometres south of the Olive Downs turn-off we turn left onto the Gorge Loop Road. 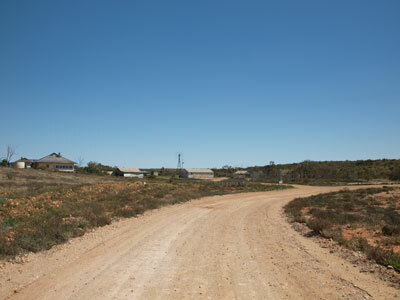 This road takes you through the old Mount Wood property (now part of Sturt National Park) to the Mt Wood Homestead area. Two kilometres down this road we stop in the bed of 11 Mile Creek for lunch. It is nice and cool here protected by the trees. We head off at 1:50 pm. At 2:08 pm we arrive at Horton Park. This was a separate property at one time but was then subsumed into Mt Wood and became an outstation. 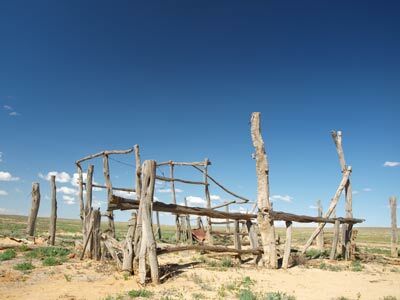 There is a very old structure near the road and further in, the old homestead. 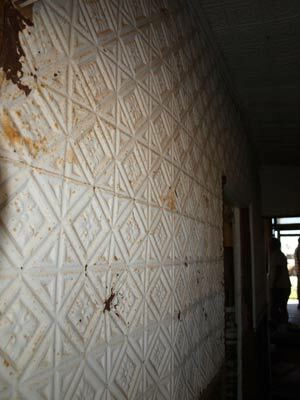 This has pressed metal ceilings and some of the interior walls are also pressed metal. It is now even hotter, 34ºC. We leave at 2:20 pm and at 2:47 pm we stop at a lookout that gives nice views back to the west over the gorge. We drive up to the Mt Wood walk car park but it is quite a walk to the top and it is very hot. We decide not to do this walk. At 3:17 pm we arrive at Mt Wood Camping Area. This is near the homestead which is now used for staff and visitor accommodation. Back in 1981 the grounds of the homestead were magnificent but in more recent years the introduced species have not been looked after as well as the station owners and the early NPWS staff did. We are the only people camped here so we have the pick of the spots. We set up camp next to the small dam which has a lot of birdlife. I then put out our solar panel to top up the power in the auxiliary battery. It is still very warm, 33ºC, and windy. Kelly and I then go for a walk to the homestead and the old shearers' quarters. 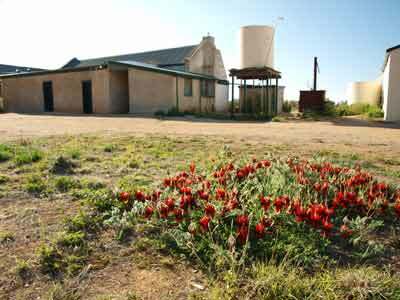 The homestead was built in the late 1800s (with more recent additions) and is certainly one of the better homesteads I have seen just behind the Willandra Homestead in Willandra National Park. We then walked to the shearers' quarters which is not too far from the camping area. The quarters were built after World War II to replace ones that burnt down (I think) but the kitchen building is from the late 1800s. These are still in use and can be booked by people. 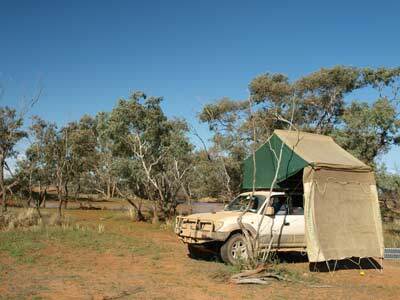 I stayed in these during our 2003 trip to the Simpson Desert. We then walk across the suspension bridge to the old shearing shed. This is also from the later 1800s. Although not as impressive as the one at Kinchega National Park, it is worth looking at. We walk back to the camping area, ready for a beer. Although it is still hot, the low humidity makes it a lot more bearable. Everyone decides to have a hot shower so I set up the shower tent and Twine and warm up the water. It is great to clean ourselves after a few days without a wash.
About 6 pm the strong wind drops off. After beer and nibblies we start the gas barbecues to cook dinner. Once again there is a problem, we can only get one burner to light and then this will not go off, running all the time. I decide to once again take the top off the gas bottle containers and turn off the gas to see what happens. I have to remove a few screws but then can bend back the lid and turn it off. Once back on, the burners appear to all work. I cook spaghetti bolognaise but the burners are not great, the heat they put out is pretty poor. There are also millions of bugs attracted to the lights and the burners. Within a short time there are thousands of dead ones on the barbecue near the burners. A bit extra protein I am sure gets in our dinner. It is a very warm night, no need for a fire. We go to bed again at the normal time of 9:30 pm, but I no longer read as I have finished all the books we brought along. It was very warm last night, so much so we had to mostly sleep without a blanket. We get up just before 8 am and after a quick breakfast, we head off. First stop is not far away, the Mount Wood Pastoral Museum. This is an outdoor display of original and replica equipment to show some of the methods used by sheep farmers to process their wool. The museum is located just off the main road and at the site of the original woll scourer. This was used to remove dirt and burrs etc from the wool so that it was lighter and better quality, thus making and saving money. We leave here at 9:07 am and it is already warming up, 26ºC. We take the left turn to Wanaaring. The road is being repaired and we pass a bit of equipment. It is a good dirt road, as it is for most of the way. We get to the intersection, or at least what used to be the intersection, for the road to Milparinka. This is still shown on maps as being a valid road, but it has been closed since well before 2003. Along this section of road Kelly notices that there are lots of tree lizards. These are sitting on branches of dead trees. There are literally dozens of them. We stop and talk some photos at one spot. There are a couple of large permanent detours now around lakes and salt-pans. 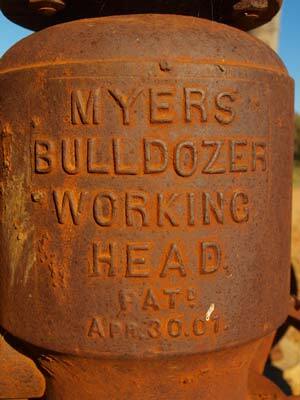 The largest one goes around the Bulloo River overflow that caused me problems back in 1978. The road now detours 15 or so kilometres around it to the south. At 10:10 am we stop at a hill and climb through a fence to get a better view of the overflow. There is a huge amount of water in it. While here, Kelly is startled by a tiger snake! At 10:45 am we stop for morning tea about 94 kilometres from Mt Wood. It is even warmer now, 29ºC. 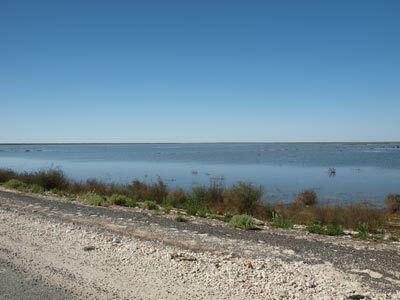 It is 122 kilometres to Wanaaring and we arrive at the Paroo Billabong just to the west of the town at 12:40 pm (average 73 km/h). We stop here for lunch while Peter T and the kids go into town for something to eat. 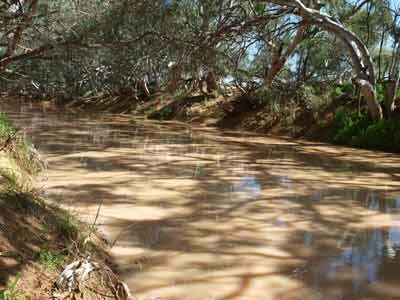 The billabong is on the old route of the Paroo River (put Wanaaring in Google maps and you will see it). We leave at 1:10 pm and drive into town. There is not much in Wanaaring, a hotel/service station and a store/cafe. Peter T is not yet finished his eating and will follow soon. 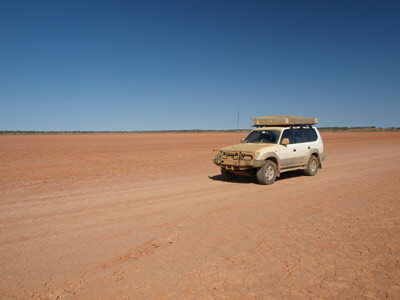 We head out of town towards Bourke. The road is called the Cut Line, no idea why, it used to be just called the Bourke/Wanaaring Road or the Bourke/Milparinka Road. 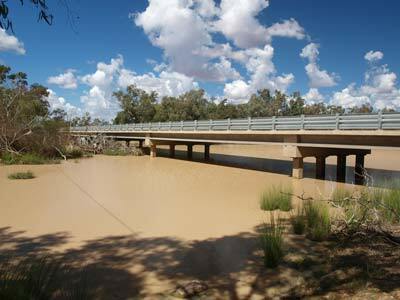 The Paroo River is just east of town and there is a lot of water in it as we expected. There is a good camp site on the western side of the channel closest to Wanaaring. The road is fairly good again. At 1:57 pm we come to the Louth Road, about 56 kilometres from Wanaaring. We turn right here. This road is not as good, quite poor in fact at first but then it gets better. There are some small tar sections towards Louth. It is really hot outside now, 31.5ºC according to our temperature gauge. 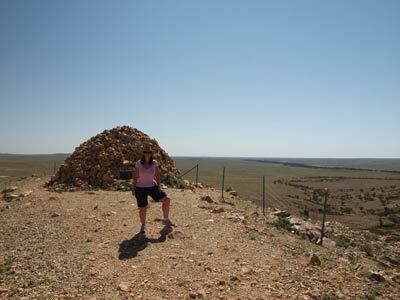 The terrain is a bit hilly at first but closer to the Darling River it becomes very flat. At 3:15 pm we arrive at the Louth Hotel (average 72 km/h). We go in and have a beer. This is really nice considering the temperature now. In fact, I have two! The pub has changed since 2006 when Kelly and I were last here. The pub has been extended and a large veranda built. This work has been done with a lot of care, it really fits into the character of the existing pub. In addition, the outside of the hotel has been "reskinned" with corrugated iron. 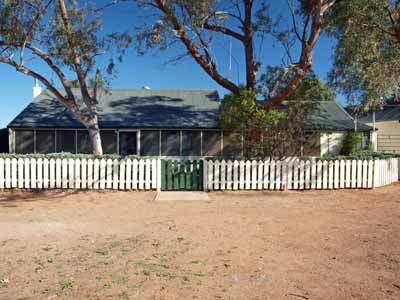 An excellent bit of work that a lot of other hotels should have followed (eg the Maidens Hotel in Menindee). At 4:05 pm we pull into the camping area. There are a couple of places you can camp. One is on the western side of the Darling River opposite the hotel and the other is on the eastern side of the river but on the northern side of the road bridge. We decide to camp here as there are quite a few people at the other location. Note that I think you can also now camp next to the hotel, but presumably you need to pay for this. The other sites are free. 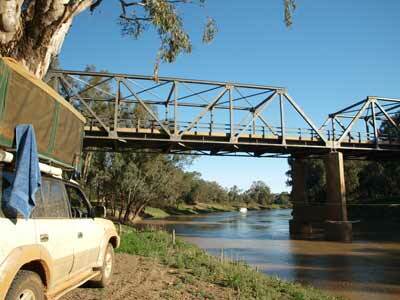 We are camped right next to the Darling River, the longest river in Australia. The water is really flowing, so different to the last two times I have been here when the water was stagnant. The rains earlier in the year are still producing results. I think of having a swim but the water is very cold. No thanks! 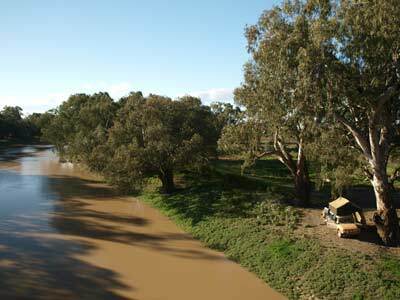 The river has the biggest river red gums you will ever see, they are huge. They make it quite cool at the camp site. We pull out all our timber as we are cooking using the fire for the first time in four days and Kelly is making sticky date puddings again. These are really nice camp sites, with lots of flat area and trees for sun and rain protection. The proximity to the pub is also great. There are also free toilets and showers in the park opposite the hotel. We intend to use them tomorrow morning before we leave (it is a gold coin donation to RFDS at the pub). We have the last drink and nibblies of the trip before cooking our dinner. I go through the fridge and pull out the Scotch fillet steaks that I vacuum sealed in Sydney as well as three packs of sausages. One of the packs has bloated, looks like it might be off so it goes in the bin. Pretty good to only lose this out of all we carried from Sydney. I cook the barbecue while Kelly prepares the dessert and Peter F makes the pasta. We have a great meal, the steaks are so tender, probably from all the bouncing up and down over the past 29 days. The sticky date puddings with butterscotch sauce (cooked in the camp oven) is brilliant as usual. Kelly and I go back to the pub after dinner and have a couple of drinks. A very relaxing end to the camping part of our trip. We are in bed by about 9 pm or so. It was a very warm night, cooling only in the very early hours of the morning. Rain is on the way, I am actually surprised that it has not yet started. We pack up early and drive up to the park to have a shower. Kelly and I go first and then the others turn up. We are all clean once again! We park our cars in front of the hotel for a group and vehicle photograph. Peter T decides to order breakfast, but Peter F and I decide to leave now. Peter can catch up with us later. We leave at 8:45 am. We arrive in Cobar at 10:20 am, travelling the 137 kilometres at an average of about 85 km/h. The last 40 or so kilometres are tar. Peter refuels and we have morning tea at the intersection of the Louth Road and the Barrier Highway. There is a truck/car stop with tables under a shelter. It is now raining and has been for the past 30 minutes or so. We leave at 10:52 am and get to Nyngan at 12:20 pm (133 kilometres). We sit on just over 90 km/h on these roads, although the limit is 110 km/h. It is now raining quite heavily. The Bogan River has the most water I have ever seen in it. 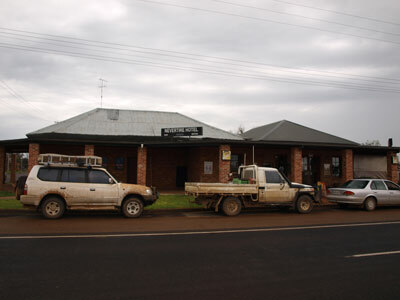 At 1 pm we arrive in Nevertire (60 kilometres) and stop at the Nevertire Hotel for lunch. Here we have an excellent meal, burgers with chips for $10, washed down with a beer. We leave at 1:50 pm and at 3:20 pm we arrive in Dubbo to a light drizzle (111 kilometres from Nyngan). We refuel (125.2 litres at $1.255 = $157.15) and then drive out to find my cousin's place. My cousin, Sharon Crosby (nee Sharon McFadyen) lives in Dubbo with her husband, Don Crosby. Don has a vet practice here. We find the place, it is out of town a bit on a nice property. It is still raining. We are so luck we left Sydney a day earlier than planned or else we would probably now be stranded somewhere between Bourke and Wanaaring. We have a cuppa with Sharon and chat about a lot of things. Until Dad's funeral four weeks ago, I had not see her for a few years so we have a lot to catch up on. We are all staying here tonight so we bring our things inside. Peter T has not yet arrived so I give him a call (or he calls me). I direct him to the location and tell him to call me on the UHF radio when he is near. I hear him on the portable and direct him to the house. We have decided to have Chinese for dinner and Sharon has booked the restaurant at the local Macquarie Club a few kilometres up the road. We head there and Don, son Will later join us (daughter Sarah has come with us - the other two boys are away at school in Sydney). We have an excellent banquet. This was probably the best value Chinese I have had for many years. After a few beers we return to the house and have a chat for a while before retiring to bed. A very relaxing night's sleep in a real bed! We are up just after 7 am and we have breakfast before leaving. We head off at 8:50 am, very happy that we had a warm house to sleep in considering it has not stopped raining all night. In fact, there are flood warnings for the Bell and Macquarie Rivers and the Old Dubbo Road that we are on has lots of mud and water. Once back on the Mitchell Highway, we turn right for Sydney. We stop at Molong for morning tea (raining) and pass through Bathurst (11:50 am) and Lithgow (12:40 pm) where the rain stops. At Blaxland we stop for McDonalds (have to have real junk food at least once on the trip) and are soon back on the way home. We arrive back at home at Kirrawee at 3:23 pm. As we approach the house, our dog Veto goes absolutely crazy, leaping against the wire door. I think she did miss us. She is off her head for about 15 minutes, rushing from Kelly to me and back again. We also have missed her a lot. This was another great trip. Although a bit rushed in parts, caused by the fact we could only have four weeks off work to do the trip, it was never really tiring. You would need a minimum of four weeks to do the trip, but longer would be better. 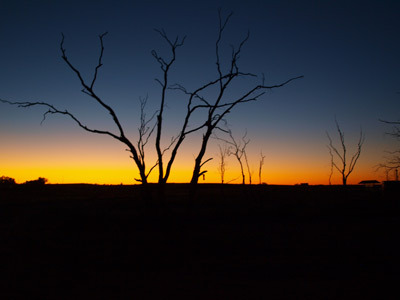 If you had the time, you could easily spend three months doing the same trip, stopping for a few days in places like Lightning Ridge, Culgoa National Park, Innamincka, Bedourie, Boulia and more days in the East and West McDonnells, Kings Canyon and Yulara. The main thing to make sure is that all the vehicles are well prepared (ours all were) and the drivers drive to both the conditions and their experience. We probably failed this last one, with one car slipping off the road and another tipping over. 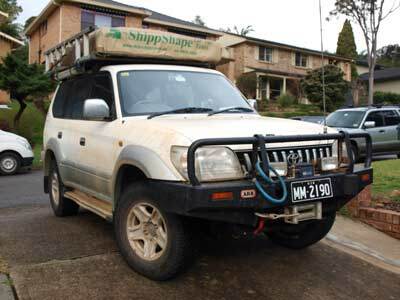 The other thing is to not do this as your first 4WD and camping trip, do a few shorter trips and refine your vehicle setup before you do the journey. You need to ensure that you carry enough but not too much. Both of the other cars were carrying items that could have been left at home and were just taking up room and making setting up camp harder than it should have been. I hope you enjoyed these articles, I am happy to provide more information if you email me (see Contact Me for email address).